A'rona Hotel01493 843870work01493 843870fax HotelThe A'rona Hotel in Great Yarmouth has 22 bedrooms all en suite. The hotel is situated near to the Britannia Pier and 50 yards from the beach. Free secure private car park on grounds, also suitable for coaches. There is a chair lift to the first and second floor. Rooms are comfortable and well decorated all are en-suite and have duvets on all beds, televisions and WiFi in all rooms. Tea and coffee making facilities are available in all bedrooms. The hotel has many features; the licensed bar has a dance floor with 2 lounges. Live music entertainment several times a week, games room, spacious dining room and excellent choice of menu. Full English breakfast each morning. 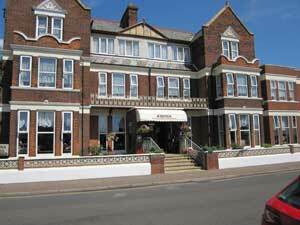 The A'rona Hotel in Great Yarmouth has 22 bedrooms all en suite. The hotel is situated near to the Britannia Pier and 50 yards from the beach. Free secure private car park on grounds, also suitable for coaches. There is a chair lift to the first and second floor. The region is easily accessible by road from all parts of the UK. Major trunk roads into Norfolk are the M11, A11, A12 and the A14 from London and the South-east, while the A47 and A14 serve the Midlands and the North. On approaching Great Yarmouth follow signs for SEA FRONT, on sea front turn left into North Drive and then second left into Sandown Road. Arona Hotel is on the right.